DUG Insight User ManualFrequently Asked QuestionsFrequently Asked Questions Installation and SettingsHow do I edit the Java's overriding Environment Variable? Other Java applications installed on your system may have configured Windows to not allow Insight to allocate the memory you set with the DUG Insight Launcher. If you are getting out of memory errors and believe the memory allocation to be incorrect, you can confirm the memory allocation here. If this is what you are experiencing, you will need to remove an environment variable called "_JAVA_OPTIONS". To do this on Windows, follow the steps below. 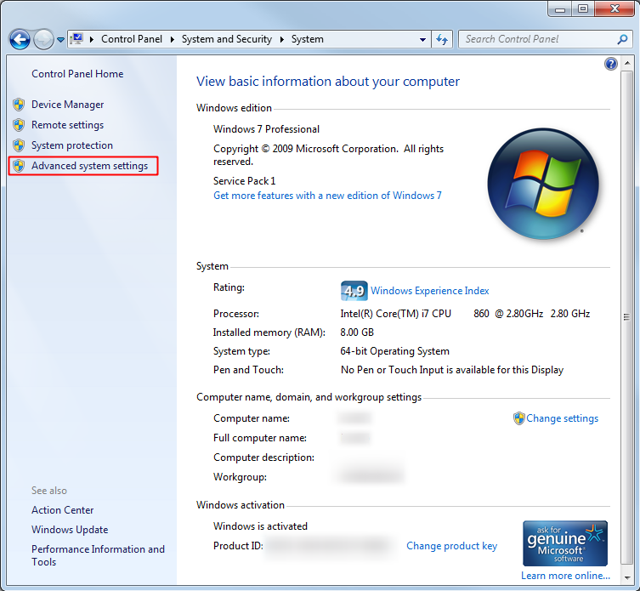 On the left panel, click Advanced system settings. This will open the Advanced tab in the System Properties window. In the Advanced tab in the System Properties window, click Environment Variables. This will open the Environment Variables window. 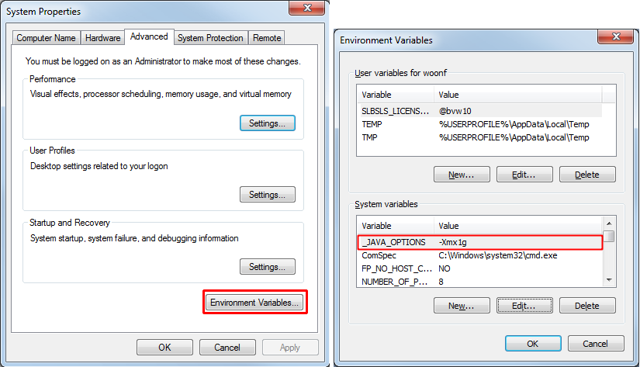 In either the System variables or the User variables section, look for the "_JAVA_OPTIONS" variable. Based on the variable value in the example, Insight will use 1GB RAM and not the memory you have allocated in the DUG Insight Launcher. Double-click the variable or select this variable row and click Edit. Edit the variable name to something else (effectively removing it by name, but backing it up in case your other Java applications truly require this setting). [Optional] If the other application works, you can now go in and delete the renamed variable. Caution: If you have other Java applications on your system that are using this variable, and given that this setting is there, this is likely to be the case, removing this setting may affect the applications. Hence, we advise to rename the variable and ensure other applications are not affected before deleting. If you need to merge the variables, contact DUG support at support@dugeo.com. Insight should now open with the correct memory allocation. Prev: How does Oracle's Java licensing apply to Insight? Next: How do I install Insight silently or via SCCM?